Designed after a traditional Italian market, ott¡mo brings the best of Micheal Chiarello’s creations together under one roof. Offering a causal dining atmosphere, coffee bar, retail and more you are sure to feel right at home from breakfast to dinner. Located behind the V Marketplace we are open daily from 8am- 6pm. We hope to see you soon! 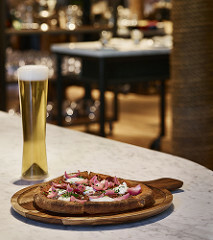 We are excited to announce that we are now offering a $15 Pizza and a Beer Happy Hour special at ott¡mo! With your choice of margarita or spicy calabrese pizza. Offer valid daily from 4pm- 6pm!